Katie Hannigan '08 just got the kind of break that can catapult a standup comic's career: She performed on The Late Show with Stephen Colbert. Her segment—which was recorded June 15 at the Ed Sullivan Theatre and aired on August 2—"went really, really well," she said by phone from her home in New York. "It was such a great experience for me." Hannigan, who describes herself on Twitter as "just another wholesome Midwestern girl with demons" and in her act as someone who "looks like she owns a muffin shop," said a booking agent for the show caught her act in March and invited her to do the show. She was the first of seven comics who recorded their sets on that day in June, in front of an audience that was specifically in the theater to see comedy, as opposed to celebrities and musical acts. The idea behind that is to make sure the comics get the best possible reception. "It definitely is a huge career milestone for me," she said. "This is something I've been working toward for years and years and years." Eight years, specifically. But at least 14 years, if you go back to her first year at Butler. After graduating from Warren Central High School in Indianapolis, where she was fascinated by experimental theater, Hannigan came to Butler as a Theatre major and immediately found herself cast in Top Girls, a play by unconventional writer Caryl Churchill. Everyone in the cast was older, and "I felt quite distinguished and honored to be able to do that show." 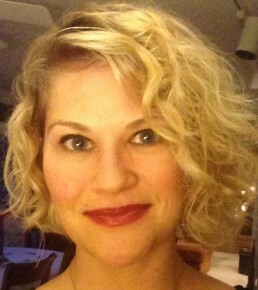 Theatre Department Chair Diane Timmerman remembers Hannigan as "talented, intelligent, and curious. Her primary focus was acting and she was and is a gifted actress. She was always an extremely funny person with a terrific sense of humor. But while she was a Theatre Major, she was known primarily for her acting abilities." Hannigan moved to New York a week after graduation. She moved in with her former Butler roommate Leah Nanako Winkler—who has also gone on to great success as this year's winner of the prestigious Yale Drama Series Prize—and they worked together in experimental theater. "I felt that if I went to New York," she said, "I would find exactly what I was interested in focusing on for a long period of time." She had other gigs too, including preschool teacher ("the kids were teaching me … that I hate kids," she says in her act) and New York City tour guide. She developed such an extensive knowledge of New York City that she's appeared in episodes of The Travel Channel's Mysteries at the Museum as an expert. And even as her comedy schedule filled, she continued to act. This month, she shot two TV pilots, including one about city yuppies who decide they're going to live off the land but find they're woefully unprepared. Hannigan said if she could choose, she would act all day and do standup at night. "I am someone who has the ability to write comedically. I also have the ability to perform and act. I have a skillset I would like to use fully in a number of different contexts." In the near term, she appreciates that standup comedy is the skill that's bringing her the most attention. "The weekend after I performed (for Colbert), it was quite a shock to my system to have accomplished that kind of goal," she said. "I was feeling kind of overwhelmed as far as what do I do next. The Late Show something that will help my career as a comedian, but I do have some big things ahead that I'm looking forward to." Katie Hannigan '08 just got the kind of break that can catapult a standup comic's career. Four Butler University students have been selected as 500 Festival Princesses for 2018. -Taylor Bowen, Michiana Shores, a senior majoring in Digital Media Production and Art Plus Design. -Natalie Cole, Westfield, a junior majoring in Violin Performance with emphases in Music Theory and Music History. -Katherine (Katie) Pfaff, Lewisville, a junior majoring in Strategic Communication: Public Relations. -Anna Rather, Bargersville, a junior majoring in English Literary Theory, Culture and Criticism. Each 500 Festival Princess will receive a $1,000 scholarship. In addition, 500 Festival Princesses are involved with the 500 Festival’s statewide community outreach programs, volunteering at 500 Festival events, and participating in various Indianapolis Motor Speedway functions, including the pre-race ceremonies and Victory Circle celebration for the 102nd running of the Indianapolis 500. Honor comes with a $1,000 scholarship. Senior Liz Niemiec has received a $100,000 grant from the LIDS Foundation for her nonprofit Little Wish Foundation, which grants small wishes ($300 to $800) to kids with cancer. 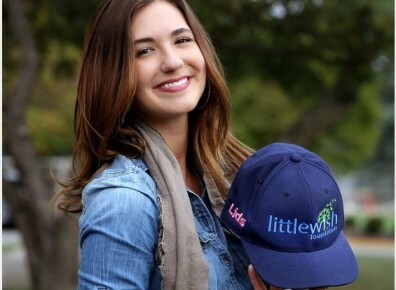 "The LIDS Foundation is extremely excited about our new partnership with Little Wish Foundation," Bailee Reynolds, LIDS Foundation manager, said in a story published February 4 in The Indianapolis Star. "Little Wish is special to us because they are a small foundation that started in LIDS Sports Group’s backyard. What (the foundation) is doing for kids is amazing. These kids know that someone is thinking of them, even if it is in a small way; it makes their day. "The Indianapolis Star reported the story in The organization has raised around $250,000 and granted nearly 400 wishes. Little Wish is a nonprofit 501(c)3 organization that Niemiec started, at age 17, in the memory of Max Olson. Max was diagnosed with Wilm's Tumor, a rare kidney cancer, in December 2007. Little Wish delivers wishes to pediatric oncology patients at Peyton Manning Children's Hospital, Riley Hospital, Riley North Hospital, Lutheran Children's Hospital, Lurie Children's Hospital, and Children's Hospital in Los Angeles, according to its website. Some "little wishes" items that have been given include laptop computers, Xbox360 & PS3 gaming systems, iPads & iPods, concert tickets, spa treatments, TVs, blu-ray DVD players & movies, pretty dresses and much more.